What is Propalin used for? 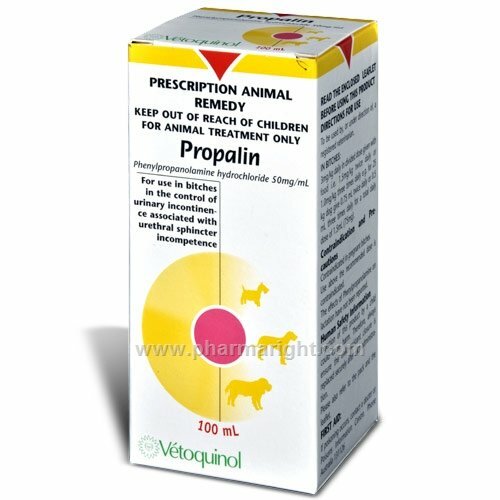 Propalin syrup is used to treat urinary incontinence in spayed female dogs. Involuntary loss of urine can occur in male and female dogs at any age but particularly in spayed females. More than 20% of spayed females are affected and mid to large-sized breeds are also more prone. Propalin syrup is an effective and palatable oral treatment for long-term management of urinary incontinence in dogs and you should be able to see an improvement within a week. Propalin syrup contains phenylpropanolamine, a sympathomimetic alpha-adrenergic agonist that mimics the effects of nerves of the sympathetic nervous system. These nerves respond to sympathomimetic amines like catecholamine and adrenaline. Urinary incontinence is usually caused by loss of muscle tone in the urethral sphincter, which is the muscle that controls urine flow out of the bladder. Phenylpropanolamine in Propalin syrup stimulates the alpha-adrenergic receptors in the urethral muscle, which increases tone of the sphincter muscle resulting in tightening of the urethra, to preventing urine leakage. Propalin syrup contains the active ingredient phenylpropanolamine (50mg/ml), used to treat urinary incontinence in dogs. Propalin syrup contains phenylpropanolamine, used to treat urinary incontinence in dogs. Urinary incontinence is usually caused by loss of muscle tone in the urethral sphincter, which is the muscle that controls urine flow out of the bladder. Phenylpropanolamine in Propalin syrup stimulates the alpha adrenergic receptors in the urethral muscle which increases tone of the sphincter muscle resulting in tightening of the urethra to preventing urine leakage. Involuntary loss of urine can occur in male and female dogs at any age but particularly in spayed females. Propalin syrup is an effective oral treatment for long-term management of urinary incontinence in dogs. What are the side effects of Propalin? The most commonly reported side effects for dogs taking Propalin, which mimic the results of excessive stimulation of the sympathetic nervous system include: anorexia, aggressive behaviour, restlessness, irritability, tremors, tachycardia, cardiac arrhythmia, hypertension, and urinary retention. Lethargy and loss of appetite have been reported in a dog following an overdose. When should Propalin not be used? How should Propalin be given? You should give Propalin syrup to your dog 3 times daily using the oral syringe provided. Add the correct dose of Propalin syrup to your dog’s food or administer directly into your dog’s mouth. The recommended dose is 1 mg/kg bodyweight which is 0.1mL per 5 kg of body weight. If you miss a dose of Propalin give it to your dog as soon as you remember, unless it is time to take the next dose, then skip the missed dose. Do not give a double dose. How should Propalin be stored? You should store your Propalin syrup between 15°C and 25°C in a cool dry place.